Yellow is a very fresh and warm colour that comes in many variations which can inevitably cheer up any space in your home. Bring some of that warm sunshine into your home with these awesome ideas and immediately transform its look. The patterned yellow wallpaper in this cosy bedroom really makes for a good focal point especially when paired with the rest of the matching yellow bedding. Neutral colours used for the rest of the furnishings allows the yellow to really stand out. This homey kitchen boasts yellow tones in various hues to keep things from being too overwhelming. The saffron yellow lower cabinets provide an interesting contrast from the light blonde oak used for the upper cabinets while the patterned backsplash made a smooth transition point. This stylish bathroom is decked out in a vintage style that works nicely with the yellow and white colour palette. A buttery yellow is used for the walls while the darker penny tiles provide a nice contrast with a couple of white patterns to go with the rest of the white furnishings. This inviting and bright living room is a beautiful example of yellow used in various tones. The walls are painted a vivid yellow while the yellow plaid patterns in the rest of the room is complemented by the bright white sofa. This pleasant kitchen uses yellow and pastel colours to create an very soothing environment to prepare your meals. The buttery yellow furniture is toned down by the gingham wallpaper and antique kitchen island in a similar colour. This cheery living room is one of the most cosy places for you to entertain your guests. The pine paneling is updated with the lemon yellow hue that really opens up the space and the same shade is used for the cushy sofa. The other comfy armchairs sport funky yellow patterns. Blue and yellow go really well together so this dreamy bedroom looks gorgeous. The lemony yellow walls are complemented by the blue tartan fabric of the headboard and armchair. Working from home can be boring but with the right decor, you will feel perfectly comfortable in your home office. This bright and perky office is jazzed up with some bright yellow walls and some dramatic vintage black furniture. Enjoy your delicious meals in this warm and homey nook that is dressed up with bright yellow colours on its walls. The vibrantly patterned pillows makes the place look even more beautiful. This quirky bathroom is superbly elegant with its elaborate furnishings. 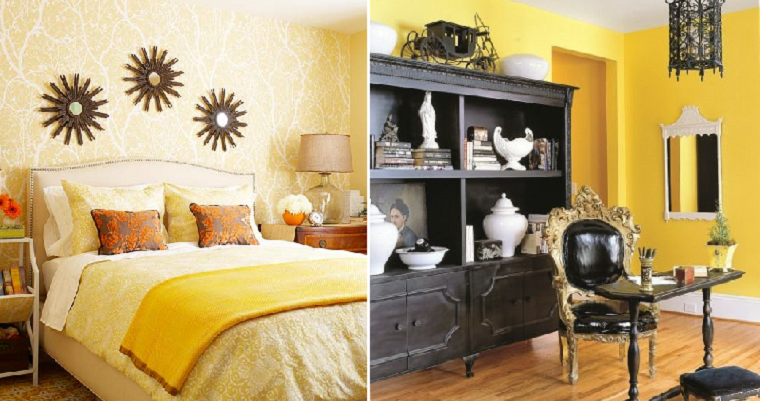 The warm yellow walls are paired with a Baroque carved mirror.